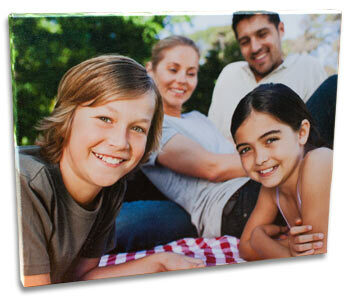 MailPix Canvas offers Gallery Wrapped Photo edges that help accent your canvas and provide a more appealing look without the need of a frame. It is important to choose a photo that has enough space around the subject to allow room for the wrapped edges without cropping into your subject. When creating your Canvas, position your subject within the dotted lines. Any part of the photo outside the dotted lines will fold around the edge of the canvas. If your photo falls outside the dotted/red lines when creating your Photo Wrapped canvas, we recommend changing your style to a neutral edge such as Black, White, or Grey. Just click on the color/background icon in the upper lefthand corner to change the wrap color of your canvas. (Optional) Easily Create an Account with your email address, or Automatically create your account using Facebook. We will save your work in your online account. Upload great photos, or connect to your Facebook account and find photos to use either from your account, or a friends! 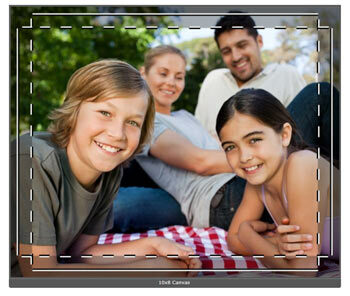 Choose a Canvas Size and style that is best for you, drag and drop your photo into place and add (optional) text to your canvas. Save and add the canvas to your cart when ready. Enter your shipping information, Key in Promo Code (if available) and click "Add" to apply it to your order, and pay using your Credit Card or PayPal Account. Place your order and we will do our part!